Enhance your immune system! Ensure is an adult nutrition shake that has ImmunBalance — a unique blend of prebiotics and antioxidants* designed to balance digestive tract health and strengthen your immune system. 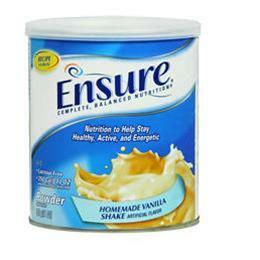 Enjoy Ensure for breakfast, lunch, or a delicious between-meal snack. Available in creamy milk chocolate, strewberries and cream, butter pecan, homemade vanilla, dark rich choclate, and coffee latte.